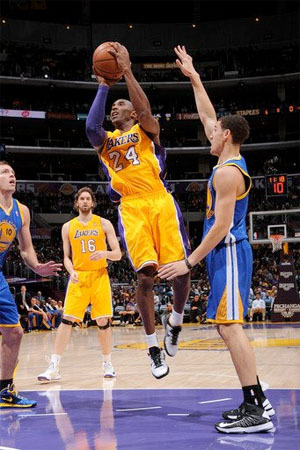 Kobe Bryant takes shot against Warriors. The By The Numbers recap for the Lakers’ 101-77 win over the Golden St. Warriors at Staples Center on Friday night. The Lakers are now 2-4, and next play home to Sacramento on Sunday night. Bernie Bickerstaff’s winning percentage as Laker coach after Friday’s game, good for the best winning percentage in Laker coaching history! Yes we know it’s only one game, we’re only joking. The amount of shots the Lakers took on Friday night, a season high. They only hit 40% of them, but were much more aggressive offensively and had far better spacing at that end of the floor than the first five games. Seems just Mike Brown leaving already led to some better offensive flow. The amount of rebounds the Lakers pulled down Friday. They have now outrebounded every opponent this season by an average of 47-37. Pau Gasol led everyone in the game with 16 boards, four at the offensive end. The amount of points the Lakers scored in the second half Friday, their best second half output this season. They also held the Warriors to under 40 points in both halves. The total points the Lakers’ bench players scored against Golden St., which marked a season-high. Two players scored in double figures…Jordan Hill had 14 and Darius Morris continues to play well off the bench, he scored 10. Hill was also a perfect 5-5 from the field. Golden St.’s bench scored just 23 points and shot a horrid 9-33 (27.3%) from the floor. The Warriors’ field goal percentage on Friday, as the Lakers defense continues to hold teams to dismal shooting from the floor. Golden St. made just 29 of their 86 shots, and were held under 20 points in two of the four quarters. The amount of turnovers Golden St. committed Friday. Finally someone turned the ball over more than the Lakers, who still had 16 miscues themselves. The number of Lakers in double-figures, let by Kobe Bryant’s 27 points on 10-18 shooting from the field and 5-6 from the line. Kobe is averaging 27.2 points, on 56% shooting from the floor, and 91% from the line through the first six games. Not bad for #24 at 34. Lakers look for two straight on Sunday against Sacramento at Staples Center. See you after the game! 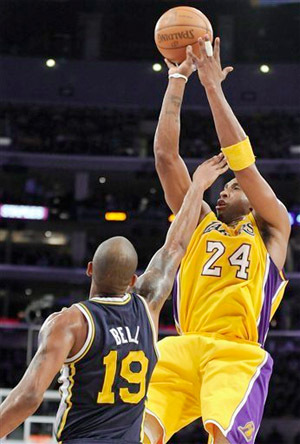 Kobe Bryant puts up a jumper for two against Jazz. The Utah Jazz hate playing the Lakers at Staples Center, and coming in with a four-game losing streak didn’t make their prospects for a win any better on Tuesday. Behind a balanced attack, the Lakers obliterated the Jazz 120-91, dropping Utah for the 17th straight time in Los Angeles. 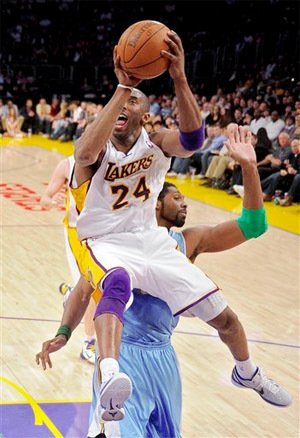 The Lakers, coming off an impressive win in Denver on Friday, continued their strong play against the struggling Jazz. They jumped out to a 37-22 lead after one quarter, and never looked back. The lead ballooned to 66-38 at halftime, and by early in the fourth quarter it had grown to 38. The Lakers finished the game shooting a season-high 62.0% from the floor in their league-leading eighth wire-to-wire victory. Kobe Bryant scored 21 points to go along with six assists, and got a ton of rest in the blowout, playing just over 26 minutes for the night. He needs just 13 points to pass Hakeem Olajuwon for eighth place on the NBA’s all-time scoring list. Pau Gasol had 20 points and seven rebounds, Andrew Bynum scored 19 points to go along with 11 rebounds and three blocked shots. Lamar Odom had 17 points and eight rebounds off the bench, including a circus shot jumper from the right baseline as he was fouled, for a three-point play. It was that kind of night for the champs. To go along with their hot shooting, the Lakers had 34 assists on their 44 baskets, with five players notching at least four assists. In fact, everyone on the team had at least one assist, except for Joe Smith who played just four minutes of the fourth quarter. Deron Williams led the Jazz with 17 points and eight assists, but didn’t get much help from anyone else. He also turned the ball over five times as the Lakers were aggressive against him on the perimeter. C.J. Miles had 14 points, Paul Milsap scored 11, and Al Jefferson was the only other Jazz player in double-figures with 10 points and nine rebounds. The Jazz are now 3-19 all-time against the Lakers at Staples Center, including the playoffs. The last time the Jazz won at on the road against the Lakers was New Year’s Day in 2006, 98-94. The Lakers have also won 12 of their last 15 overall, including three of four against Western Conference playoff teams. They’re now sitting at 33-13, 5.5 games behind the conference-leading Spurs. They also have the NBA’s third best record behind San Antonio (38-7) and Boston (33-10). The Lakers’ next game is Friday night against the last place Sacramento Kings, who they have beaten 14 of the last 16 times the teams have faced each other, including two easy wins this season. The Lakers will look to avoid a letdown before Sunday’s huge match up against the Boston Celtics at Staples Center. That game will be the first between two teams since the Lakers 83-79 win in Game 7 of the NBA Finals last June.